Back in June we were able to gain access to Waiouru whilst it was in Ben Harp’s compound. I seized the opportunity to take a full set of photo’s which have proved to be very useful in supporting our insurance claim. This is one of the photo’s from June. 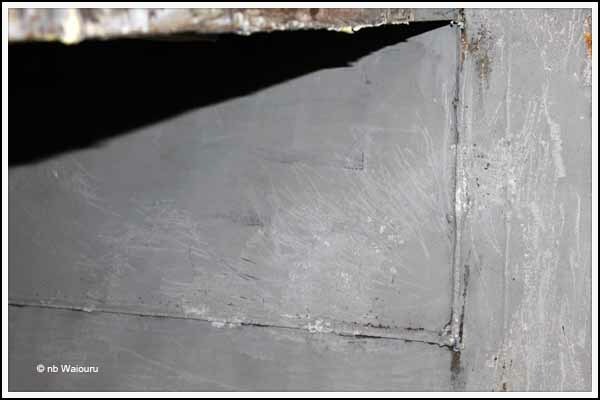 When we implemented the High Court order and recovered Waiouru I was stunned by the stripping of the interior and the wanton defacing of the exterior. I didn’t notice it…… Did you? Today I was removing a length of timber battening running down the full length of the ceiling. It had to be removed as it was occupying the channel that will be used for the 12v DC wiring. 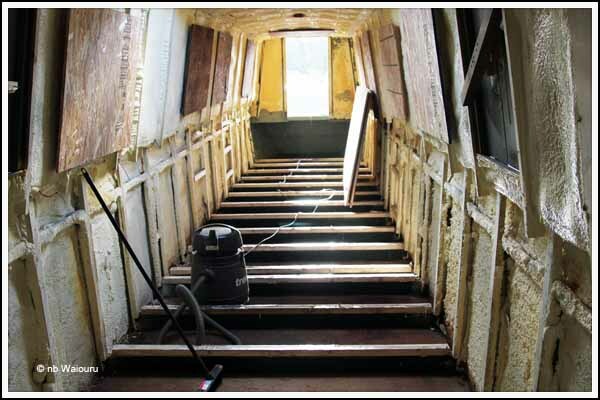 Although the interior was stripped back to spray foam there was a sheet of thin plywood on both sides of the rear cabin walls above gunwale height. I hadn’t paid much attention to them, but today I needed to remove the left plywood panel in order to remove the last of the ceiling batten. You probably noticed it in the first two photo’s. 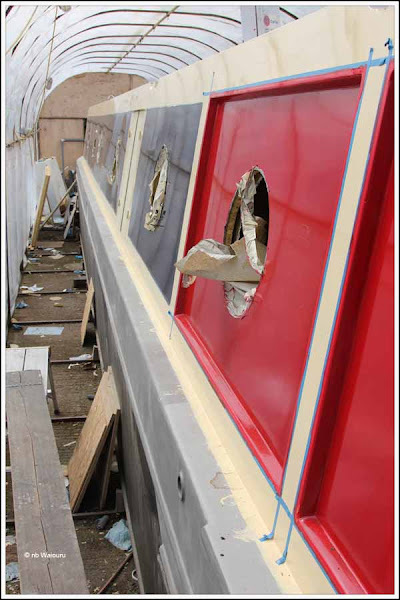 Sometime after June the rear cabin portholes openings have been filled in and the exterior panel carefully repaired and repainted. I assume the plywood on the inside had been installed to disguise the exterior work. I removed the plywood from the opposite side of the boat and found the following. I then counted the exterior and interior porthole opening and finally checked the plans. Yes, we are missing the two portholes in the rear cabin. I guess it was part of Ben Harp’s strategy to disguise the boat and sell it as a sailway! 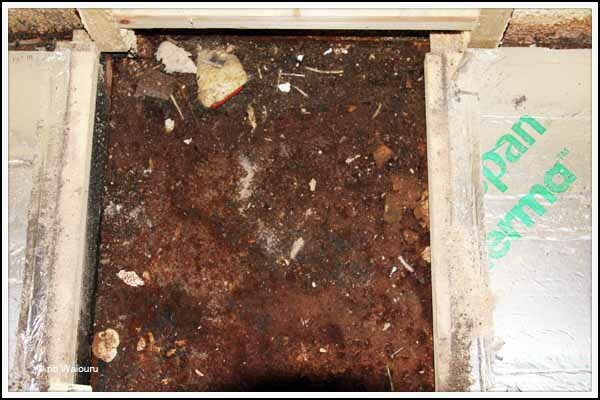 Well I’ve now been working in the bilge for the last few days and it’s now clean. I’ve removed four large plastic rubbish bags of rubbish, swept it four times, and now vacuumed it. 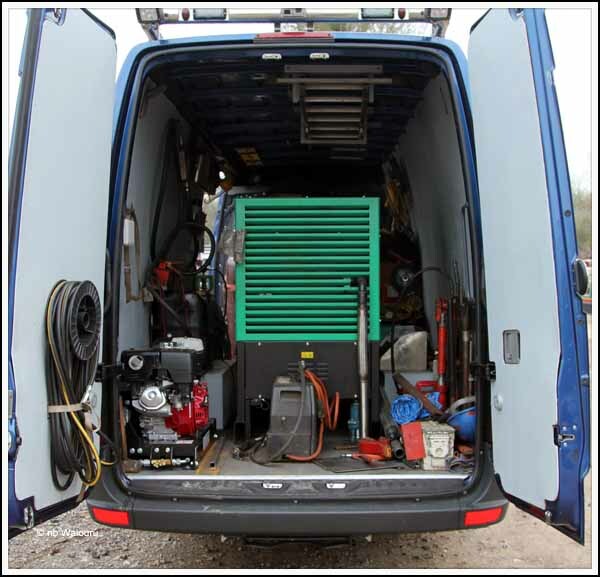 Removing the floor and temporary Houdini covers has allowed air to circulated drying out the baseplate. This is turn has loosened more sawdust. I estimate the area will be completely clean in a couple of days. By the time the timber caps have been removed from the steel cross beams there will be very little of Ben Harp’s work left in the boat. Today I pulled up the floor. Unsurprisingly there was quite a mess! The floor has to be replaced as it’s shutter ply rather than the boil-proof ply I had specified. It had also “sprung” which would have created havoc with the vinyl flooring. On pulling up the second piece of ply I noticed there was no Kingspan insulation underneath. 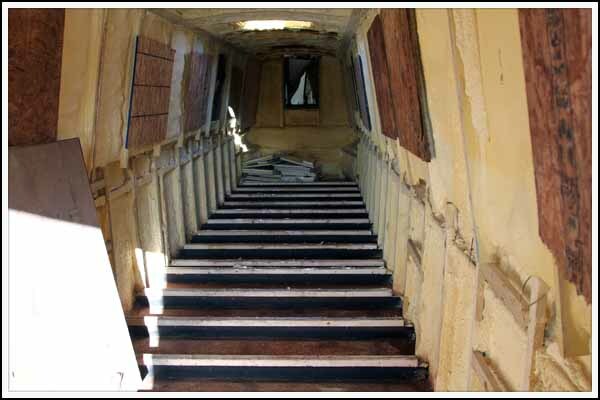 My initial assumption was this had been done deliberately to allow access for “trim ballast” once the boat had been completed. Then I realised the section of floor was located underneath a wall partition. As I removed more of the ply I discovered more missing insulation. 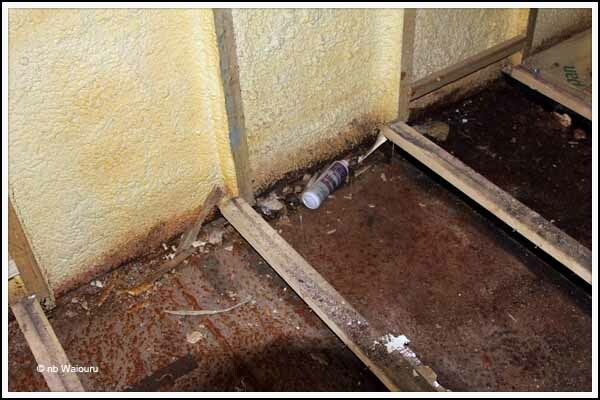 Notice how much building debris has been left in the bilge. There were two empty Red Bull cans and a considerable quantity of wood shaving, sawdust, screws, etc. 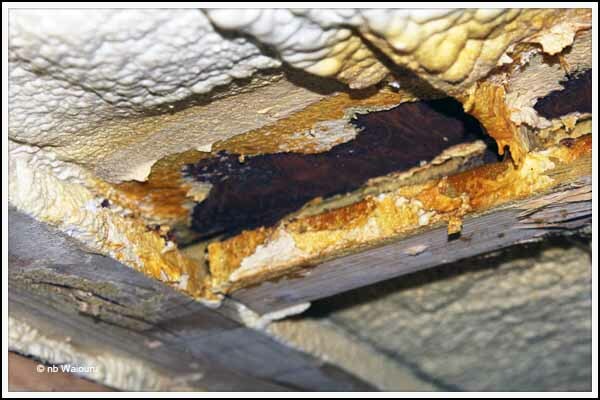 In many instances the drain points between the steel floor joists and the sides of the hull were blocked and all the debris was wet and rusting the baseplate. I’m not even sure if the baseplate has been given a protective coating. 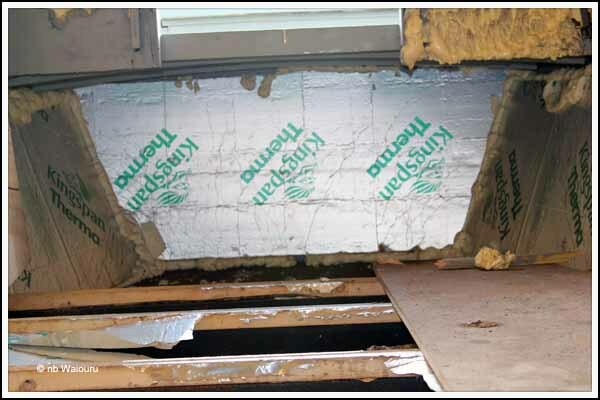 This insulation panel had collapsed during installation and no attempt had been made to rectify the defect. I spent most of the afternoon sweeping and cleaning the bilge. Tomorrow I’ll use the heaving industrial vacuum cleaner to remove all remaining loose matter. 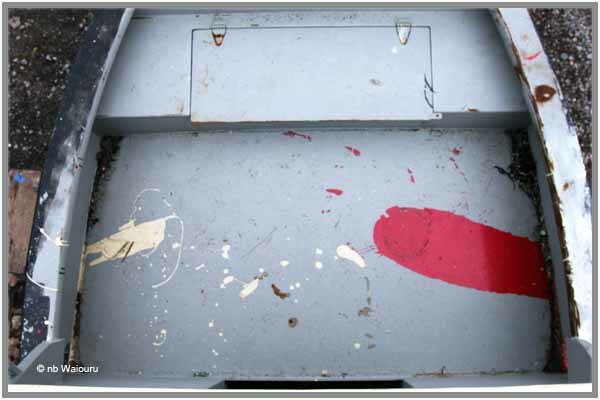 I want to get the condition of the baseplate back to the same standard as the area I’ve already cleaned in the rear of the boat. Richard, the joiner, informs me the timber capping on the steel joists will need to be replaced as it isn’t tanalised. 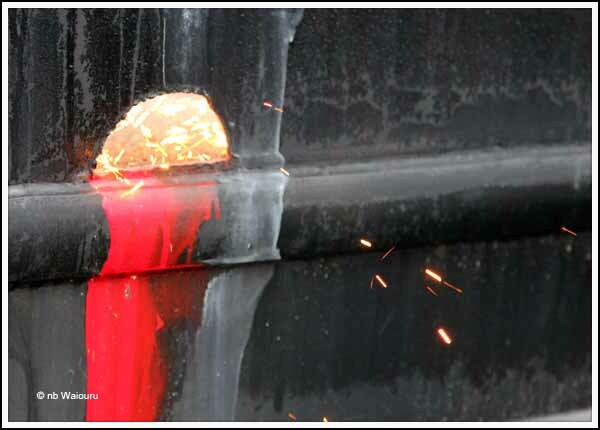 I’ll also ask Andy where we should consider having the baseplate grit blasted back to bare metal when we have the exterior of the shell done. There was more light inside Waiouru after I removed the temporary covers on the inside of the Houdini hatches which had been screwed to the ceiling battens (I now have removable temporary covers on the roof). 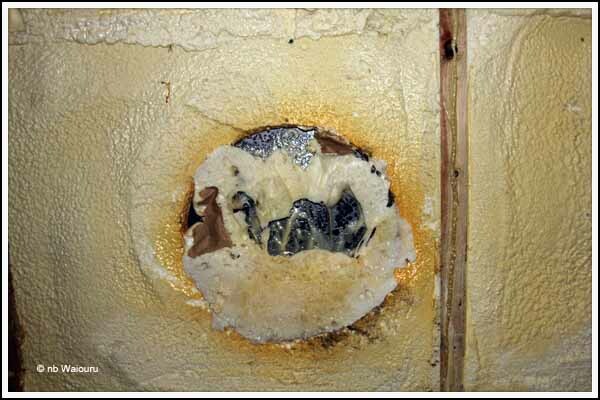 After examining the application of the spray foam insulation I could see there are some problem areas. 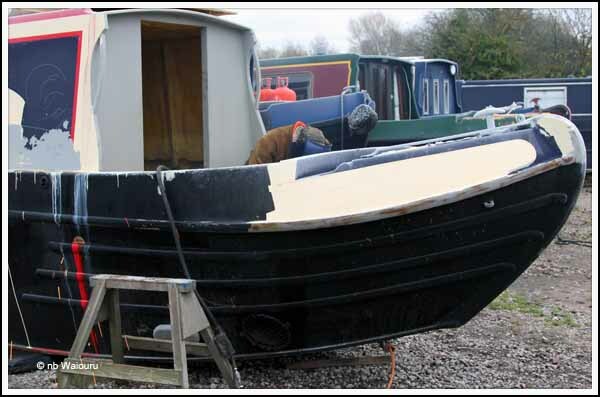 My guess is that the standard of application gradually deteriorated as the work progressed from the bow to the stern. 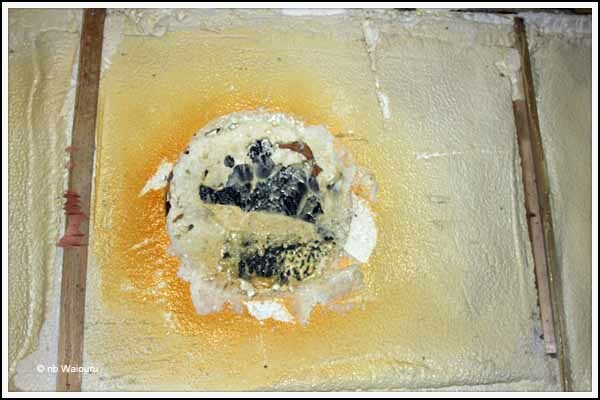 There were numerous “blisters” in the ceiling foam towards the rear of the boat. They were easily pulled off revealing rusty bare metal. 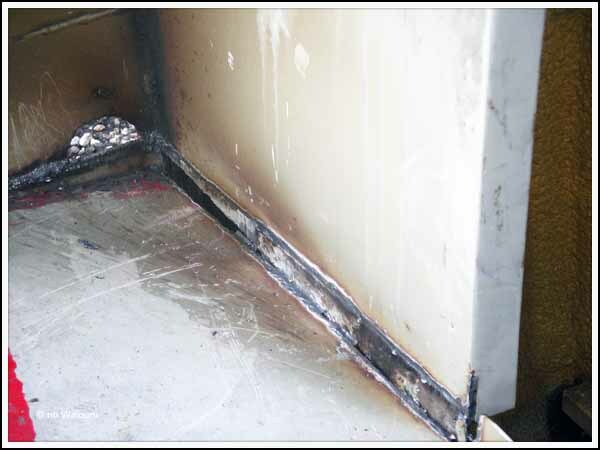 Obviously the foam didn’t correctly adhere to the steel and the layer of foam was very thin. One can only wonder what the boat might have been like after a couple of years had Ben Harp completed the boat. I’ve also noticed some of the spray application is very thin (almost non-existent) at floor level. 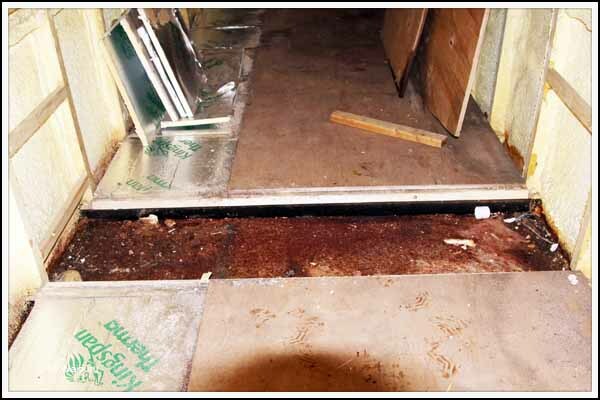 Despite this; down the port (left) side of the boat, all the drain holes in the floor joists have been filled with spray foam. 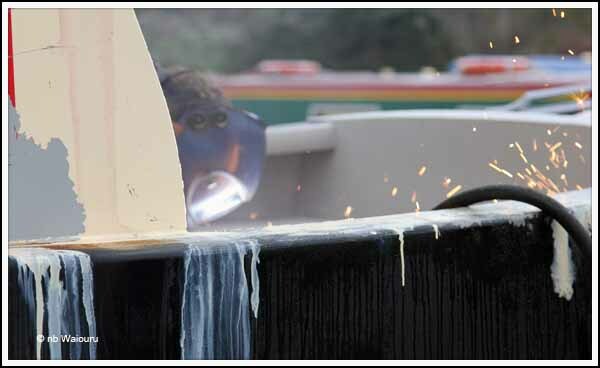 This means any water in the bilge would “pond” rather than trickle to the bilge pump in the engine compartment. I’ve now cleared all the drain holes. 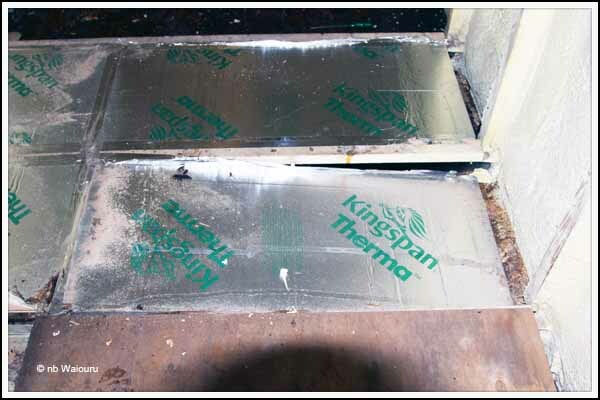 Finally, I had specified the there must be a thermal seal between the Kingspan underfloor insulated panels and the spray foam on the walls. Of course it hadn’t been done! We would have ended up with a cold line at floor level. So it appears there is quite a bit of work to do rectifying the insulation. I wrote in yesterday’s post how; without our consent; Ben Harp had raised the foredeck and removed the lockers. Today I worked on the area under the deck. 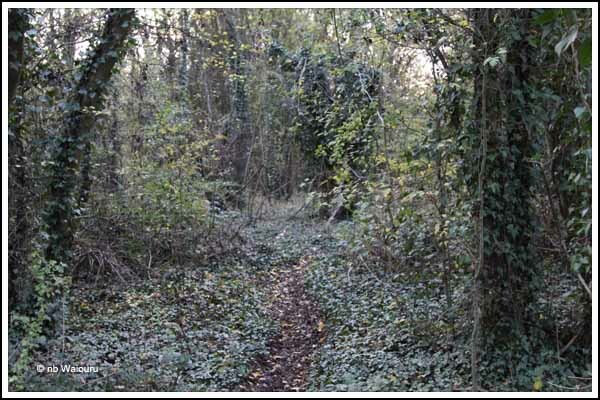 After the unauthorised modification the area looked like this. 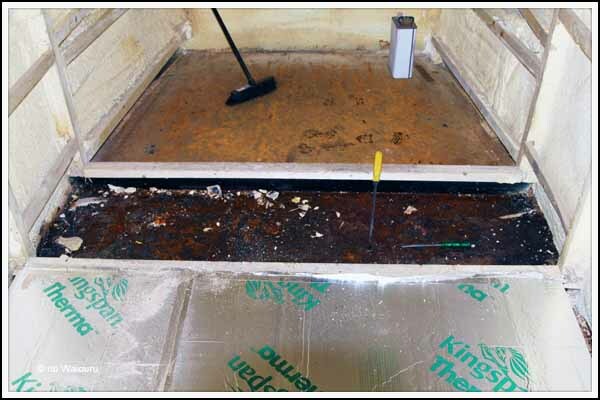 We had specified ‘Kingspan’ insulated panels under the floor and as you can see some of them have been used to line the area under the foredeck. 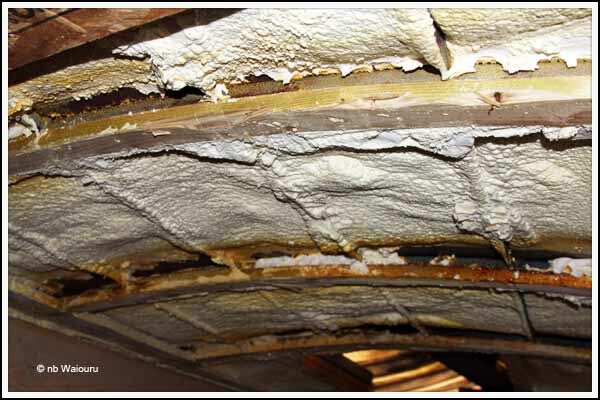 They had been glued in place and it took quite some effort to remove all the foam insulation. I needed to remove it to allow Dennis access for his welding of the new deck level and lockers. Removing all the Kingspan revealed the markings of original deck level. This is where the deck will be reinstated. 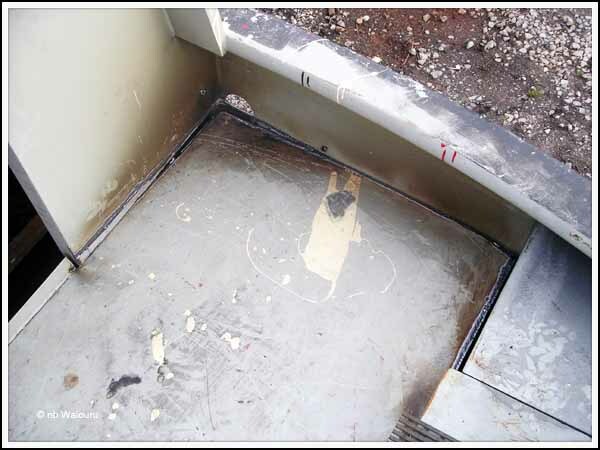 The top of the photo below is the current level of the deck and the horizontal weld is the original deck level. Underneath (that is; below the weld line) will go a second, stainless steel, potable water tank. I need to measure the area and calculate the storage capacity. Hopefully the combined capacity of both tanks will be approximately 120 gallons. Tomorrow I’ll make a start on removing the timber floor. Dennis, the steel fabricator, was at the boatyard today and I took the opportunity to discuss the scope of the welding required to restore the foredeck. The actual deck needs to be lowered and the diesel and storage lockers rebuilt. 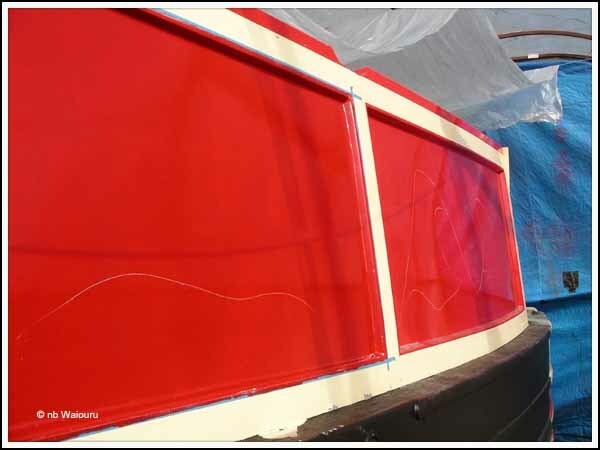 This is how the foredeck was designed and fabricated by Wilson-Tyler. The fuel tank for the diesel stove is on the port side and the storage locker to starboard. And this is the foredeck after Ben Harp modified it without our permission. The lockers have gone and the deck has been raised. The area under the deck has been insulated with some of our underfloor Kingspan insulation panels stuck to the hull with spray foam. I assume this was done to disguise the residue of the original steelwork. I have agreed with Dennis that I will scrap off and remove all the spray foam and Kingspan insulation by Monday and he will then make a start on the restoration. 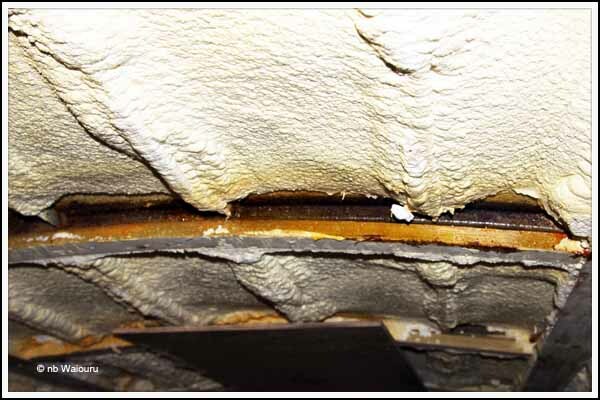 The insulation needs to be removed otherwise the heat from the electric welding is going to create some serious fumes in a confined space. 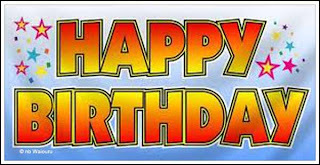 It seems to be the season for birthdays! Jan has completed an internet food order with Tesco. As a first-time user she received a discount of £15. Making up the online order seemed to take her hours as she trolled backwards and forwards looking for the cheapest most cost effective options. Eventually the order was complete and despatched. We waited to see if it would be accepted. 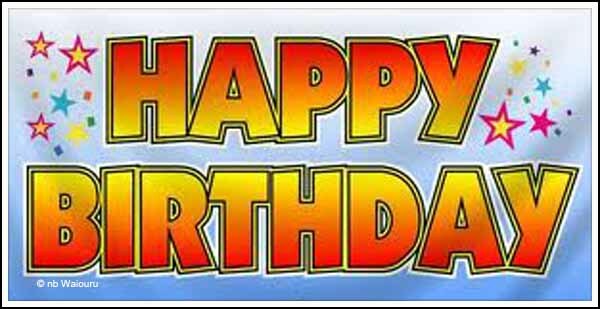 A confirmatory email was duly received and this morning a text message arrived informing us the delivery would be between 2:15 and 3:15. 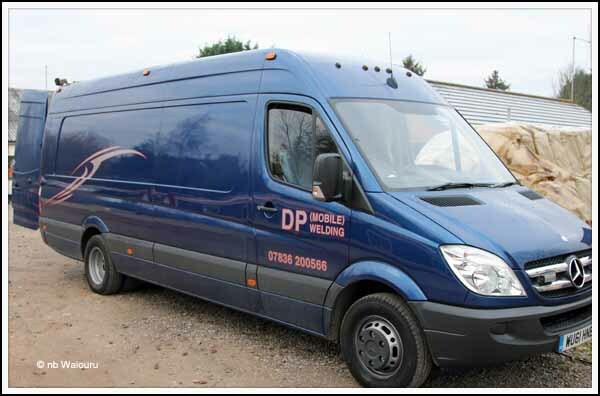 The delivery van arrived at 2:45 outside the boatyard office where I was patiently waiting. Most of the items were dry, canned, or long-life. The plan is to shop for meat and fresh fruit & veg later this week. The delivery driver make the observation he had never seen such a large order from a first-time buyer! I think we now have sufficient quantities of the various items to last at least a month. It then took me approximately six return trips to the boat to get everything on board where Jan was unpacking and stowing. 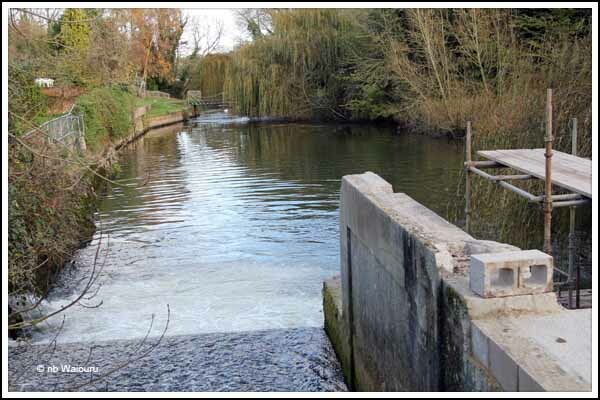 After filling the water tank and the Tesco delivery Ufton seems to be lower in the water and more stable. An hour later we had a shower, so everything worked out well. I hadn’t realised how mundane my life had become until I read that back in Australia our eldest son now has a python living in the wall. Apparently it’s 9ft long so only the cat is worried! Whilst I had discover a potential opportunity to place duck a l'orange on the menu Jan really excelled herself today. We were back in the local wetlands when she stopped and quietly pointed. 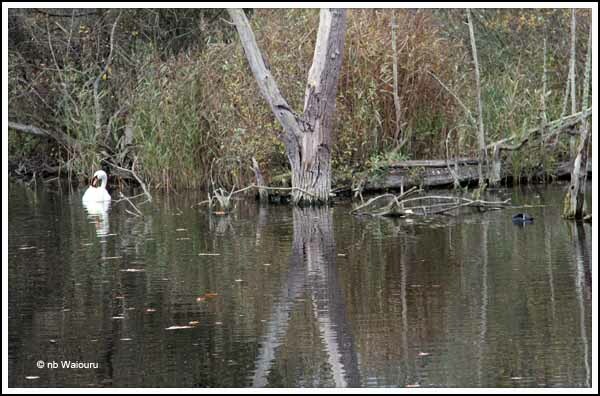 The last time I ate swan was on the Chatham Islands back in 1979, and they were black swans. I distinctly recall the meat was very dark and had a very strong “gamey” taste! I’ll leave the local East Europeans to eat the fish from the canal. In 1990 I ate fish from a similar looking water environment. They were carp from the marshes adjacent to the Shatt Al Arab river on the border of Iran and Iraq. I remember them being full of bones and tasting of mud and sewage! The boat water tank experiment has concluded. After 14 days of use there was still some water in the tank. The bow was certainly higher by 4-5 inches. It took 50 minutes to refill the tank using a standard diameter garden hose and with good water pressure. We weren’t miserly with the use of water during the 14 days so I’m quite impressed. We will need to ensure Waiouru has a similar holding capacity. 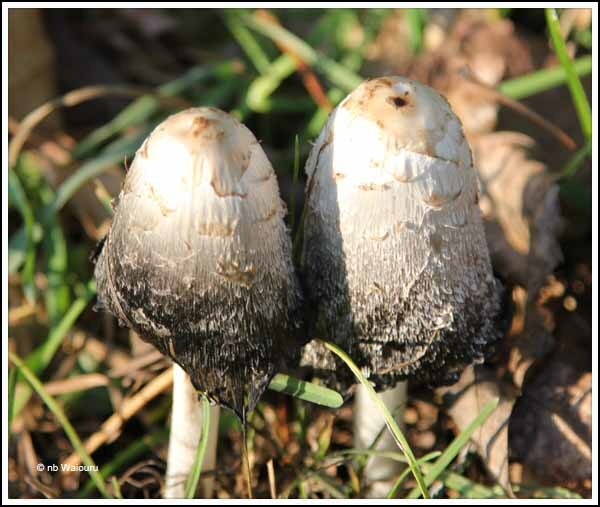 Did I mention these two fellows had popped up on the edge of the towpath beside our mooring. 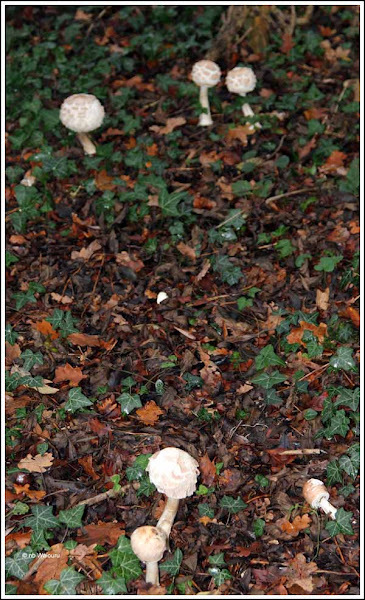 I’m not sure if they are edible…. Somehow they don’t look like they should be eaten? Perhaps I’ll ask Jan to try one! 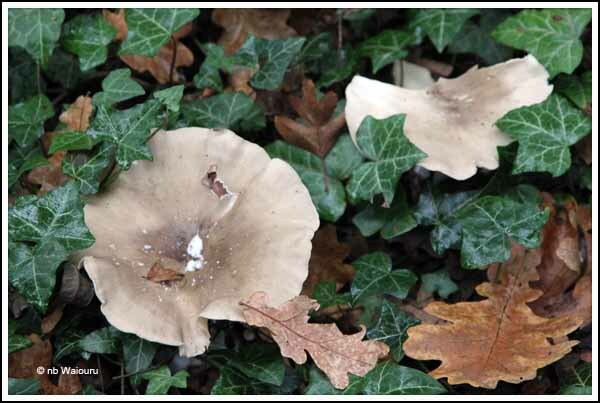 We went for a walk through the woods in the afternoon and came upon another couple of varieties. 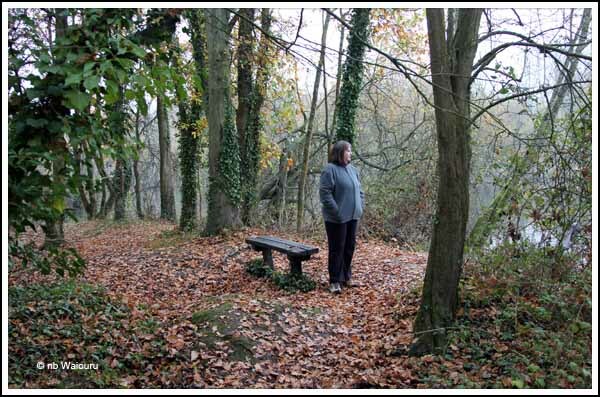 I’ve been enjoying the autumn walks through the woods and today Jan joined me for a stroll along yet another path leading to the Salmon Race. I now realise the Salmon race and farm are in the same location! It was going on dusk when I crossed Padworth Lock and ventured into the adjacent wetlands. 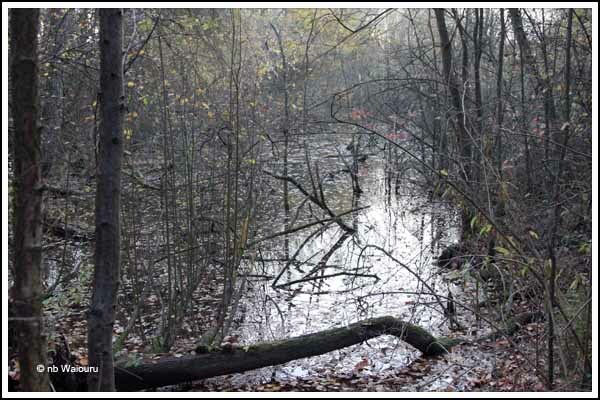 The environment is nothing like South Australia with spongy damp ground underfoot and the smell of rotting vegetation. Despite the brambles there’s a “softness” about the flora. 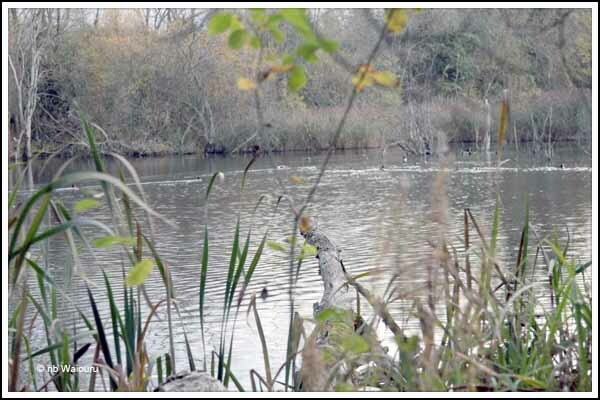 The area is peppered with small lakes or green covered ponds. I spotted Christmas Dinner before she fled across the water with her friends……. another day perhaps. Apparently there is a salmon farm nearby, so more exploring must be undertaken! Although our TV was purchased when we arrived in the UK back in early June, lack of room and a transient lifestyle has meant it been left in storage. Today I managed to rig up some temporary connections with the dual objectives of confirming it actually works and providing a greater selection of channels. The existing TV on Ufton is quite small and also analogue. It only receives four channels and the picture quality is very poor. Our TV has inbuilt Freeview and Freesat tuners, however we didn’t have a digital aerial. 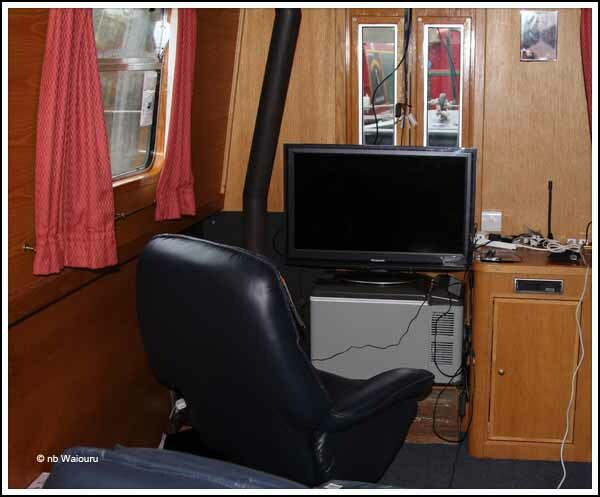 Paul; one of our “liveaboard” neighbours, was extoling the quality and size of his TV aerial so I went down and had a look at his setup. The aerial was quite small and available from Maplin at a very reasonable price. Another plus was the free delivery. I couldn’t purchase it online as we don’t have an address, but I was able to order it by phoning their purchase line. It arrived within two days; which rather impressed me! 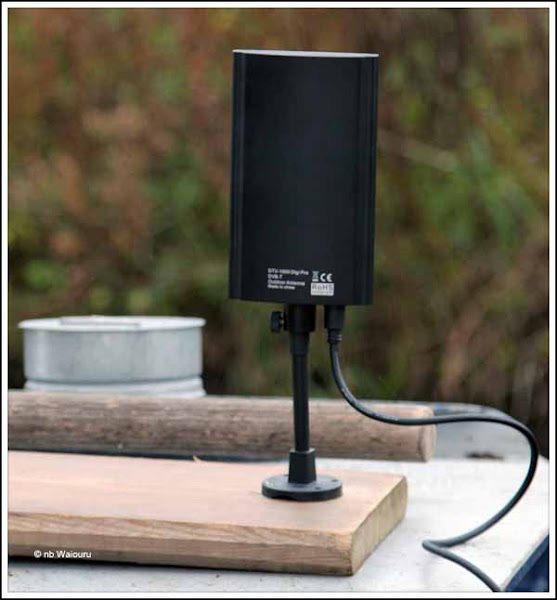 The aerial requires a 12v DC power supply for the built in amplifier and it does need to be directed at the nearest tower. It came with both a suction mounting bracket and a pole bracket. I needed to secure it to the roof and realised the suction cup would probably fail on the curve of the roof. So I’ve used one wood screw to secure it to the boarding plank using the pipe bracket mounting. A more permanent solution might be to fit the aerial to a telescopic pole and have a 150-200mm length of steel pipe welded to the roof of Waiouru to hold the base of the telescopic pole. After looking online at the Screwfix, B & Q and Homebase websites; using a telescopic window cleaning pole looks a viable option. The TV is currently sitting on top of the 12v Engel freezer at the front of the saloon. This isn’t the ideal location and it’s actually too close to my chair leaving me with a kink in my neck looking over my shoulder to view the screen. However it will have to suffice for a few days until I can relocate it. Eventually It will be mounted on the wall in Waiouru using a swivel arm. Having now installed the aerial and setup the TV I can confirm the Freeview signal from the aerial is very good. Eventually we will reach the point where the satellite system is also connected to the TV. But that won’t be until the complete system is installed on Waiouru. Three days ago I mentioned a couple of good ideas I had seen on nb Meand’er which is moored ahead of us. I only saw this one by chance when Kevin decided to fill a bucket with hot water whilst I was passing on the towpath. 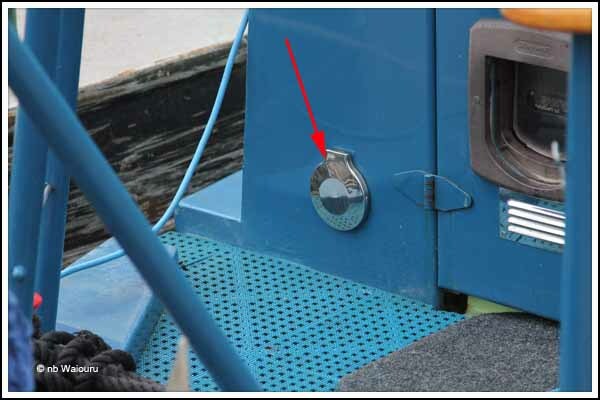 Behind this hinged circular chrome hatch on the back of the boat is a retractable hose connected to the calorifier. Great for washing footwear, obtaining a bucket of hot water or cleaning mud off the dog! I also mentioned Kevin’s bracket on the back of Meand’er. It was originally used to carry their bikes but he now uses it to carry the anchor and go-kart fenders. A circular clothesline can also be fitted to the top. I’ve now asked Andy to incorporate both initiatives into Waiouru. 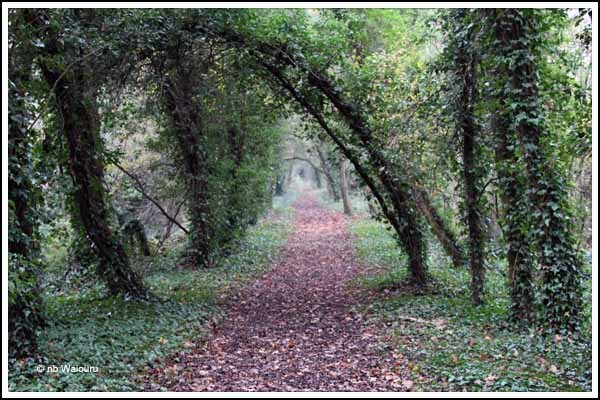 Today I walked down the towpath to Theale. A round trip of just over 10 miles. Jan had given me a Sainsbury’s shopping list and I also wanted to window shop in the the nearby Homebase. At the top of Jan’s shopping list was “purchase a 3 Mobile top-up”. I remember to buy the top-up right until I reached to check-out counter and then promptly forgot. Facing another long walk tomorrow Jan took pity on me and did some online research before informing me the local canal cafe beside the boatyard advertises it sells mobile top-ups. Hope she’s right otherwise I’ll have another long walk. We’re experiencing long and peaceful nights knowing we are so well protected. It wasn’t always like this with unfamiliar noises causing broken and sleepless nights. However everything changed with the onset of Autumn. The trees are almost bare of foliage which has opened up the countryside. 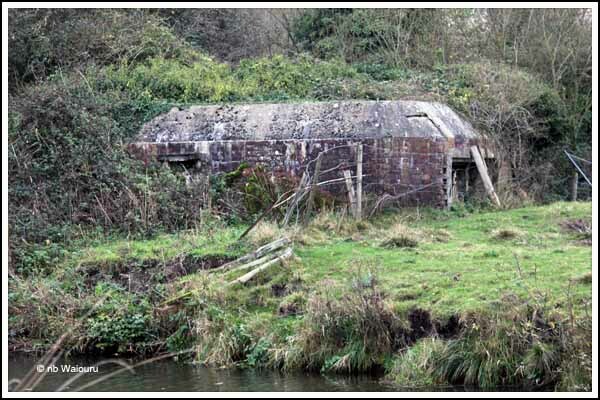 To our surprise we found two derelict WW2 pillboxes near the boat on the far side of the canal. Jan remembers as a very small girl entering a similar fortifications whilst she was a boarder at a school nearby. I was initially surprised to see they were made from clay bricks with a concrete roof. 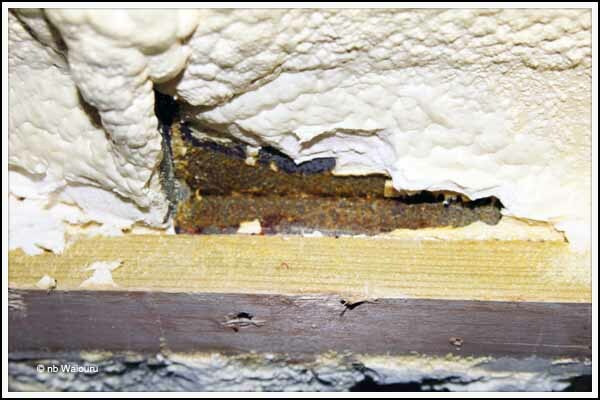 But then bricks will stop a bullet, provided the wall is of sufficient thickness. 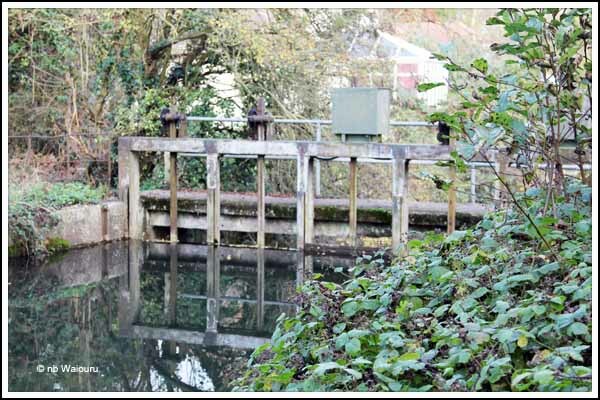 My interest aroused I delved into the local history to find out the Kennet & Avon was part of a “stop line” built as part of Britain’s “Defence in Depth” strategy should Hitler’s forces invade southern England (Operation Sealion). This particular “stop line” was the largest in the UK and known as the GHQ Line. 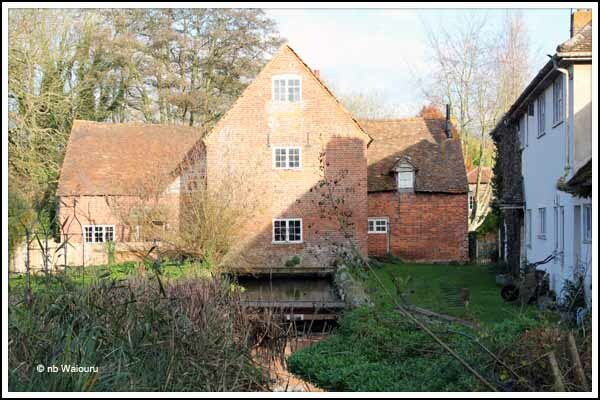 It ran from Taunton, along the River Brue and the Kennet and Avon Canal to Reading before going around the south of London south of Guildford and Aldershot, to Canvey Island and Great Chesterford in Essex, then headed north to end in Yorkshire. The canal would certainly have been an obstacle to vehicles, but I would have thought the pillboxes would be better placed on the northern bank of the canal. 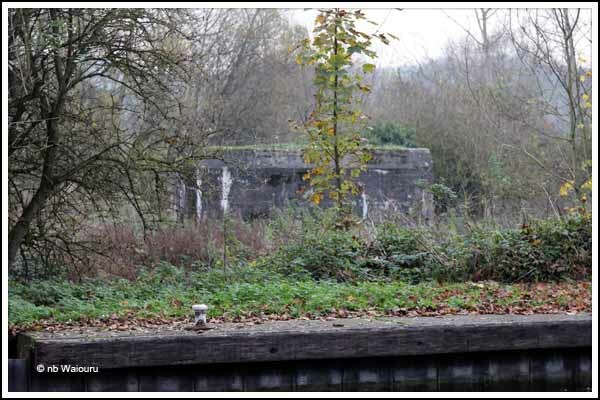 Still, I suppose if the troops manning the pillbox had to withdraw, crossing the canal on foot wouldn’t be much of an obstacle.